﻿ National Folk Fest "Rozhen 2009"
In the month of June 2009 is conducting one of the most significant events in Bulgaria in the field of folklore - the National Folklore Festival "Rozhen 2009". Organizers of the event is Smolyan Municipality, in partnership with the Ministry of Culture, District Administration Smolyan, a number of agencies and institutions. By decision of the Organizing Committee provided a sabora to present and folk groups, individual contractors and drawn from all over the country. According agreed regulation of each municipality to provide time for expression within 20 minutes. For this purpose the Ministry of Culture is turned with a recommendation to the mayors of all municipalities to create the necessary organization in the territory of the municipality and a selection of which will be broadcast participants representing her down. In organizing destroyed on the ground speak organizational recommendation to seek the assistance of regional expertise, consulting and information centers "community centers" and the Union of community culture centers. 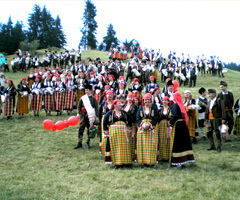 Eligibility have individual contractors, combinations and groups performing Bulgarian folklore. The results of examinations of amateur groups should be represented in the Ministry of Culture at the latest by 20 December 2009, indicating not only the names of the winners, but the number of participants, and Program, which will be presented . Information required for the preparation of financial resources to implement National Folklore Fest "Rozhen 2009". By the Ministry of Culture coordination is done by the Directorate Regional cultural activities.